Study magnets and make your own compass! April 4 - Total Lunar Eclipse. A total lunar eclipse occurs when the Moon passes completely through the Earth's dark shadow, or umbra. During this type of eclipse, the Moon will gradually get darker and then take on a rusty or blood red color. The eclipse will be visible throughout most of North America. April 13 - 18 - International Dark Sky Week. International Dark Sky Week is held during the week of the new moon in April. It is a week during which people worldwide turn out their outdoor lights in order to observe the wonders of the night sky without light pollution. So go ahead and turn out your outdoor lights this week to appreciate the beauty of the night sky! Spring Monarch Migration - Monarch butterflies leave their Mexican roosts during the second week of March, flying north and east looking for milkweed plants on which to lay their eggs. 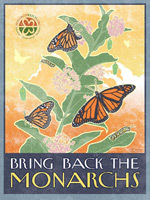 These Monarchs have already survived a long southward flight in the fall and winter's cold; they have escaped predatory birds and other hazards along the way, and are the only Monarchs left that can produce a new generation. If they are unable to find milkweed when they arrive in the U.S., then they will not be able to lay their eggs and continue the monarch life cycle.